Manila, Philippines - The Overseas Workers Welfare Administration (OWWA) has recently released the results of scholarship exam for academic year AY 2014-2015 conducted in September 2013 in various testing centers nationwide. Out of the 4,476 total applicants, the list of the top 200 passers for the Education for Development Scholarship Program (EDSP) was announced. 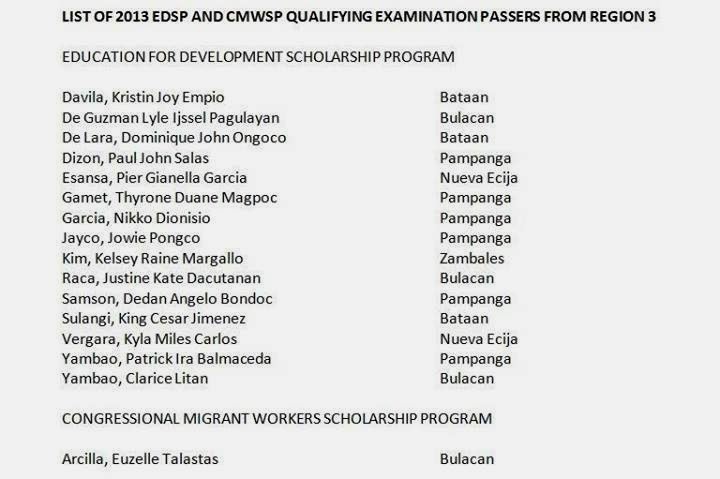 In addition, qualifiers for Congressional Migrant Workers Scholarship Program (CMWSP) were also named. According to OWWA, the number of scholarships was doubled this year from 100 slots. OWWA scholarship examination was facilitated by the Department of Science and Technology (DOST). The EDSP is a scholarship grant offered to qualified beneficiaries/dependents of active OWWA members who intend to enroll in any four or five-year course. The program offers a financial assistance intended for education amounting to P30,000.00 per semester or equivalent to P60,000.00 per school year. A passer of CMWSP is for inactive OFWs not more than 45 years or their children not more than 21 years old who wish to take up science and technology courses at any CHED accredited school within the region. This grant includes tuition fee and other school fees of P10,000 per semester, monthly stipend of P3,500, book allowance of P1,000, and clothing allowance of P500. 29 students from the SOCCSKSARGEN Region passed the qualifying examinations for two of Overseas Workers Welfare Administration’s (OWWA) scholarship programs. 18. Gevic Kay P. Velez from Buenavista, Guimaras. Note: The complete list of EDSP and CMWSP qualifiers will be posted here once available online. TheSummitExpress will update this page once results for other regions were already released. You may also visit to the nearest OWWA Regional Office to check for the list of passers. In addition, official information for the passers will be sent directly to the scholar qualifiers and to their corresponding schools principals or heads. OWWA said that the non-qualifiers for the EDSP can still apply for the OFW Dependents Scholarship Program (ODSP) where, if qualified, a student will receive an amount of P10,000.00 per semester or P20,000.00 per school year. Meanwhile, OWWA in some regions are now accepting applications for the Education for Development Scholarship Program (EDSP) and Congressional Migrant Workers Scholarship Program (CMWSP) for school year 2015-2016. The scholarship grants are part of the continued efforts of the OWWA and the government to look after the welfare and condition of the OFWs and provide them with support in recognition of their valuable contribution to the country's economy.